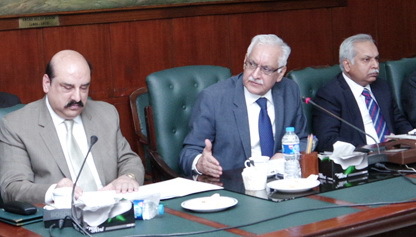 Lahore: Chief Secretary Punjab Khizar Hayat Gondal has directed that provision of free medicines and best medical facilities be ensured in all the hospital of province, saying that no negligence would be tolerated in this regard. He said that it is responsibility of district officers to achieve the targets fixed for improvement in health and education sector. He also ordered Commissioners and DCOs to personally monitor both the sectors and submit a performance report on monthly basis. He issued these directions while presiding over a video link meeting to review provision of healthcare facilities in hospitals in the province, especially in South Punjab. Addressing the meeting, the Chief Secretary said that like cities, provision of best medical facilities for people of rural areas is the top priority of the government. He said that all resources are being provided for provision of best healthcare to people at their doorstep. He mentioned that attractive salary package and other benefits are being given to the doctors serving in far-flung areas so that they could work with more dedication and commitment. He warned that no negligence and laxity would be tolerated in provision of medical facilities to the people. He directed the DCOs to ensure 100 percent utilization of funds for provision of missing facilities in hospitals and construction of dangerous schools buildings and complete these tasks as early as possible. He said that performance in health and education sectors would also be reviewed in the Commissioners’ Conference to be held in the end of this month. DCOs and EDOs (Health) of Layyah, Muzaffargarh and Bhakkar gave briefings to the meeting through video link. Advisor on Health Khawaja Salman Rafique, Secretary Health, Secretary Finance, Commissioner DG Khan, and officers concerned attended the meeting.